Compliance apps map IT System components to compliance controls. A “component” can be any part of a system that contributes to its operation including organizational processes. Compliance apps collect and assess information about one or more system components and translate that information to compliance documentation. Compliance apps can collect information about a system component from people (via web-based questionnaires) and from system components (via an Automation API). A Compliance app is a collection of “modules” for gathering information. A module is a collection of questions and output documents. A module can have just questions and output documents, just output documents and no questions, or both questions and output documents. The typical user experience will be to first pick a “top level” app from the compliance catalog representative of IT System, then pick the “component” apps that represent the specific components of the IT System, and then iteratively complete the questions within the component apps modules. Technically speaking, a top level app is a module containing questions whose answers are other apps. The below diagram depicts an exploded view of the relationships between a top level app to a component app to modules and questions. 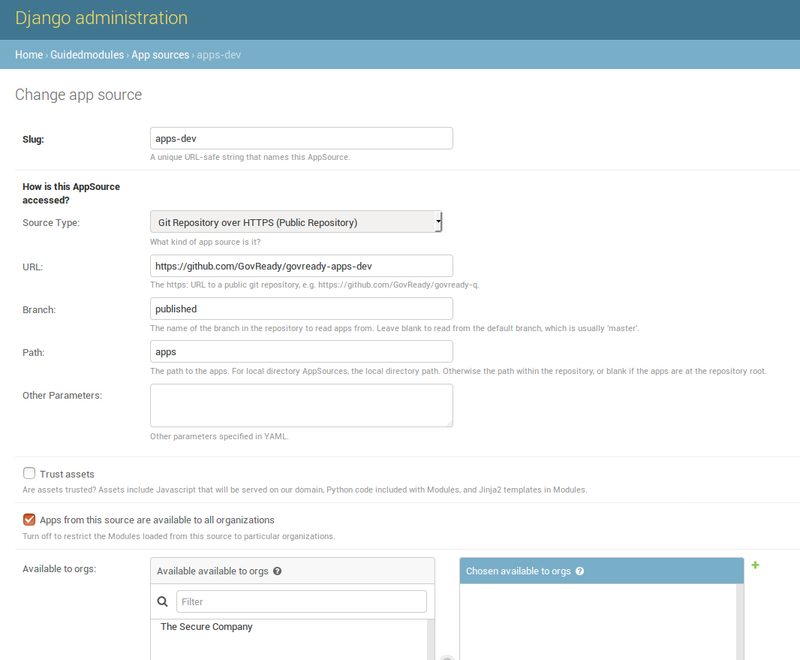 By convention, each app is required to have app.yaml file which holds metadata for displaying the app in the compliance apps catalog, such as its title and description, and an assets/app.png graphic which displays as the app’s icon. app.yaml also holds the top-level module questions which define the layout of the app’s main screen once it is started by the user. The contents of README.md are also displayed in the apps catalog. Other module YAML file may be includes in the app as well, as needed. The assets subdirectory can contain any static assets that will be served when showing the app’s modules for the user, such as images included in document templates. A file typically named app.png in the assets directory is the app’s icon, which is displayed when browsing the app catalog as well as when the app is used within another app, if icon: app.png is specified in app.yaml. It includes app catalog information, i.e. metadata, that will be shown in the app directory, such as the app’s short and long description, version number, vendor, etc. 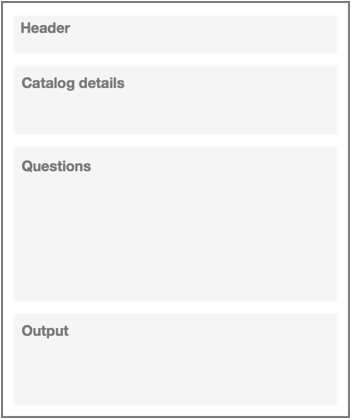 It also defines a module (see Modules, Questions, and Documents) which defines the top-level layout of the app. The module may only contain questions whose type are module or module-set. One-line description of the app here, using Markdown. It can be multiple paragraphs and is Markdown. This (optional) content will appear at the top of the TabName tab. The questions in the app YAML file can only be of type module and module-set. The questions can specify a module-id to refer to another module within the same app or a protocol to allow the user to choose any app that has a matching protocol value set at the top level of the YAML file. See Modules, Questions, and Documents for details on these question types. A module YAML structure is identical to app.yaml structure but without the catalog details section. Apps that describe the required components of a compliant IT system are considered “Top Level” apps. Each question in a Top Level app specifies a type of compliance app (e.g., a compliance app “protocol”) that is needed to represent that component. Separating compliance apps from the compliance server enables a much richer ecosystem and virtuous cycle of innovation than having everything embedded exclusively within the compliance server. A GovReady-Q deployment can pull app and module content from local directories and git repositories. An organization using GovReady-Q can freely mix compliance apps from third parties with private compliance apps located only on their network. Compliance apps are very much like modular plugins that customize the compliance server to the unique system and components of the organization. This leaves the need to specify which compliance apps are available to a compliance server deployment. This specification of available apps is known as an “app source” and is done with a JSON “spec” file entered in the AppSource model via the Django admin interface. The process is currently a bit clumsy with terminology that reflects the software’s evolution toward the app concept. Nevertheless, the approach provides flexibility of sourcing apps from local file systems and public and private git repositories. And each source specifies a virtual filesystem from which one or more top level apps and compliance apps can be found located. The below screenshot of the AppSource module in the Django admin interfaces shows the JSON “spec” file. The AppSource module also contains fields to indicate to which subdomains of the deployment the source’s apps are available. After making changes to modules or AppSources for system modules (like account settings), run python3 manage.py load_modules to pull the modules from the sources into the database. This only updates system modules. Other modules that have already been started as apps will not be updated. Each time you make a change to an app, you can reload changes using the app authoring tool in GovReady-Q.